Note that the mirrors have the same height in both cases. There are 3 points to notice. 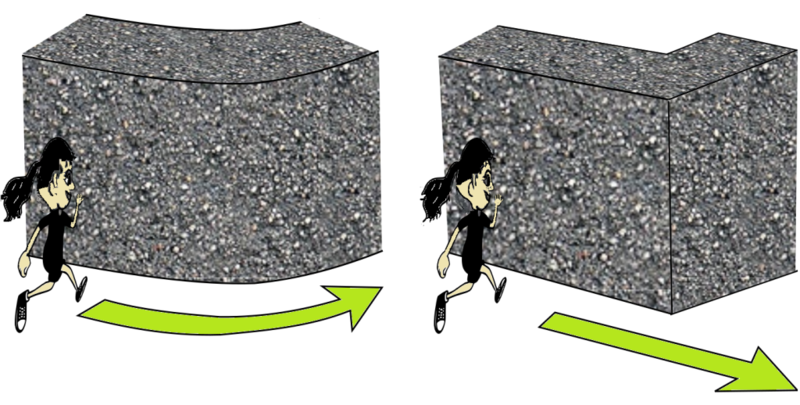 If the wall curves smoothly you will be able to go around even if you run really fast. But if there is a sharp corner, you will find it hard for your hand not to leave the wall. There is a lot more to the separation phenomenon, but for the purposes of this lesson this is enough. Second, the wake behind the bluff mirror is wider than the wake behind the streamlined mirror. This can be noticed by comparing the distance between the row of red vortices and the row of green vortices in the two cases. This is easy to understand, because just upstream of the separation point the particles are moving in vertical direction in the case of a bluff mirror, but they have already turned and are moving downstream in the case of the streamlined mirror. Third, observe the horizontal velocity in the wake. For the bluff mirror case the velocity is quite small on the centreline of the wake. The reason is also easy to see: the fluid in the vortices is rotating clockwise in the upper row and counter-clockwise in the lower row. This, in turn, happened because of the friction between the wall and the fluid when the fluid was going along the body. The velocity in the wake is greater for the case of the streamlined mirror, but even in that case this velocity is smaller than the velocity outside the wake and away from the mirror. Checkpoint: you should now understand, even if at a very simple level, why the flow separates, why the wake of the bluff mirror is wider, and why the velocity in the wake of a bluff mirror is slower, or at least be aware of these facts.